I still can’t believe my baby is TEN!! It’s been an emotional year as I anticipated his birthday and reflected on the past decade, but then when the day finally arrived, it was happy and joyous (and I didn’t even shed a tear)! We celebrated our big boy with pancakes for breakfast, an afternoon spent at the school’s summer fair, pizza dinner with friends and then a sleepover party that evening. It was a happy day! 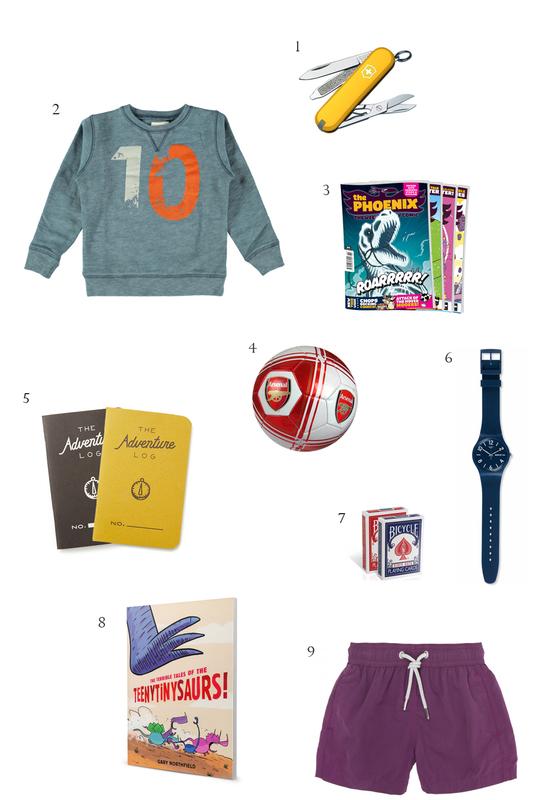 Following on from my post about what to buy a 6-year-old birthday girl, I’d love to share some of Easton’s favourite gifts he received last week. I’ll admit that I was really, really stumped for what to get him. And the sweet boy didn’t make it any easier, insisting he didn’t really need anything. 1. A simple Swiss Army Knife for carving sticks on the beach this summer. 2. A sweatshirt to celebrate double digits!!! 3. A subscription renewal of the Phoenix Comic magazine, because he SO looks forward to Fridays when his weekly comic magazine arrives. 9. A pair of swim trunks for the summer! Please share in the comments below any other suggestions for what to buy a 10-year-old. I’m sure other readers would appreciate the tips! Some wonderful ideas here. I find it particularly hard to buy gifts for boys but I love these. Would never have thought of cards but of course that makes complete sense- who doesn’t like card games at that age!!! Such lovely gifts. It does get harder as they get older to think of thoughtful and inspiring gifts. The sweatshirt is a clever idea too. I have the Leonardo DaVinci Aerial Screw Wood Kit and the ‘Amazing Leonardo da Vinci Inventions you can build yourself’ book earmarked for my engineering obsessed sons forthcoming birthday. Thank you so much for sharing these and previous wonderful gift ideas….I am always stumped for my nephews and nieces who are older than my little ones and these ideas are very useful. A beautiful boy and very sweet that he didn’t ask for any presents. Very expensive nylon swim trunks, £49! !, and according to another post of Courtney’s, her sons do not like that type of trunk, they like the tightly fitted ones they are pictured wearing in other posts. I don’t usually make comments like this, I usually make comments related to the post but I’m noticing recently that you Rachel, are making some mean comments on the Babyccino Kids blog. If you really don’t like what you read why subscribe and read it? I don’t really want to read /see your comments when I’m having a cup of tea and getting a bit of ‘me time’ whilst reading this blog. Shouldn’t we be supportive to other mums – I mean the job is hard enough as it is! I think by the way, Courtney that it’s a great list and I’m loving this series. I can’t wait to see what lies ahead. And if you have any teacher gifts please share! Rachel, your posts on the bikini debate proved you’re not a fan of the website. Why don’t you go and browse a website that you do like instead of looking bitter on this one. Courtney, my son is turning one next week so these presents are a bit old for him just now. I do love them though! Especially the sweatshirt with the number of their birthday. I’ve just ordered one with a great big number one on it. Also, if you read this Blog more carefully you would have noticed that Courtney is the one who likes the tight fitting (more European as she called them) swim trunks while her boys prefer the loose ones. I guess a recurring theme as boys become more concious of their bodies and appearance as they grow older. So it looks to me like Courtney honored her boy’s wish and researched a nice pair of loose swim trunks that he will enjoy wearing this summer. I’d call that respectful and successful parenting. And these kind of trunks do come in many price categories. It is a list for gift inspirations after all. Nice job Courtney! Such lovely ideas! My son is into Tintin comic books. It does get harder as they grow older. I try to stick to this: something they want, something they need, something to wear and something to read. Couldn’t agree more with want/need/wear/read. It has totally simplified Christmas and its forced us to think outside the box to find some neat new books or to really consider what our kids need. I love the want/need/wear/read method! Good advice! 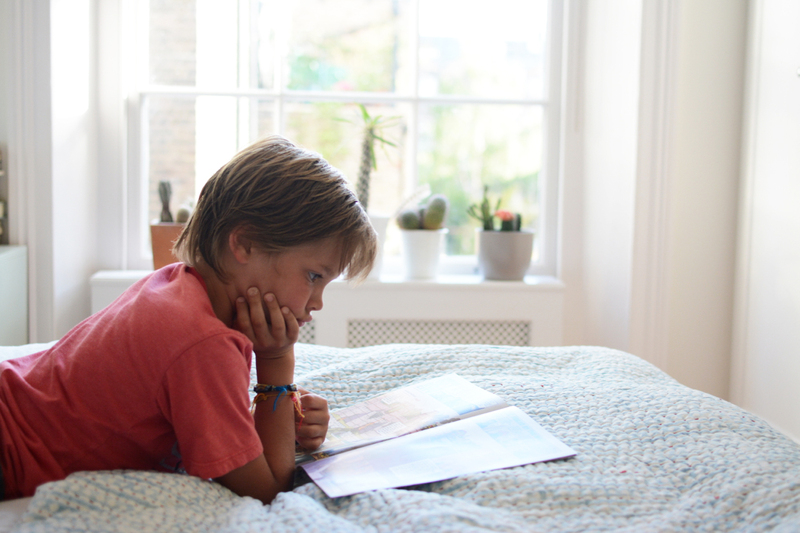 My children aren’t near 10 years of age yet, so I’ve not experienced this age and it’s relevant birthday gifts personally, but friends’ children have often asked for money at this age – they all seem to be saving for something special. This does not feel like a very personal gift, but it seems to be what they want. Haha! That Dot-to-Dot Cityscapes book does indeed look ‘epic’!! Thanks for the tip! The last 10-year old boy birthday we went to, we gave the thinkfun laser maze game which was a huge hit (my 8-year old boy loves it too). 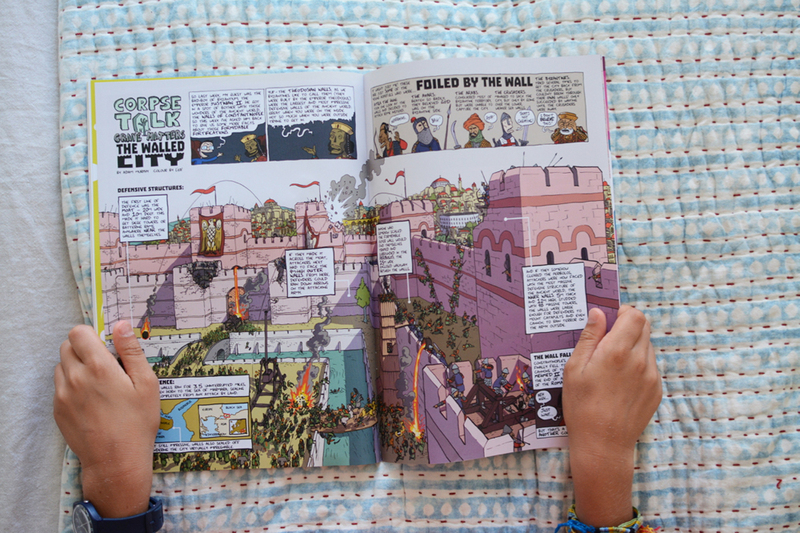 The Rainbow Orchid comics are a huge hit too with my little Tintin fan too. I gave my daughter an old fashioned electric typewriter. From Amazon it was about $80 if I remember rightly for her 6th birthday but I think it works for ten year olds too. She loves typing out letters and stories and seeing her words banged out right on the page. She has written the most beautiful stories and stapled them together with covers – it was a huge hit. Happy birthday !! Hi Courtney, I love buying birthday presents for my two, and I have bought some great pressies based on your recommendations of books etc.. I have an 11 year old, and will be doing the comic subscription for Christmas. Not sure if there are weekly options in Australia but I will check it out. great idea! Thanks for sharing your ideas and experiences. Love the typewriter idea. For boys this age, snap circuits seem to be a big hit. Our nephew loved the gift. They can make all kinds of things. Great hands-on science. Happy birthday ‘eastie beastie’!!! 10, as Esther stated to me we probably know each other almost a decade….. I think Easton had a great birthday present collection! Gives me some ideas for David – thank you. Love these ideas! My boys also enjoy comics and will have to check that subscription out, soccer anything (we have a Chelsea fan, a Real Madrid fan and a Manchester City fan ), Swiss Army knife and cards. My middle son turns 10 this fall. A few things that he and my 12 yr old son have received and enjoyed: Magic card trick book (to go with the cards), an electronic keyboard (think old school 1980’s ha! ), and board games like Scotland Yard, Clue, Scrabble, Life and Risk. My oldest loves a book called Maze by Christopher Manson, and my middle son loves this series: Usborne Puzzle Adventure series (which we have mostly bought second hand). An ice-cream birthday party for Ava's 7th -- fun, sweet and easy!